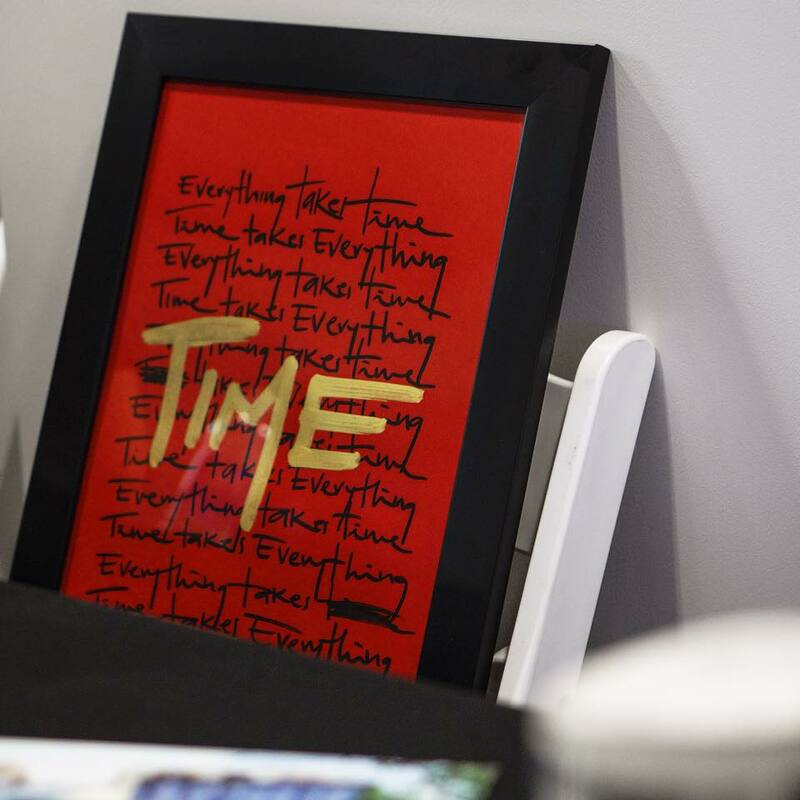 Everything Takes Time, Time Takes Everything 🔴 has a new home. Thank you everyone for the high interest and bidding on the piece. Honored to have donated this artwork in support of our alma mater New World School Of The Arts. 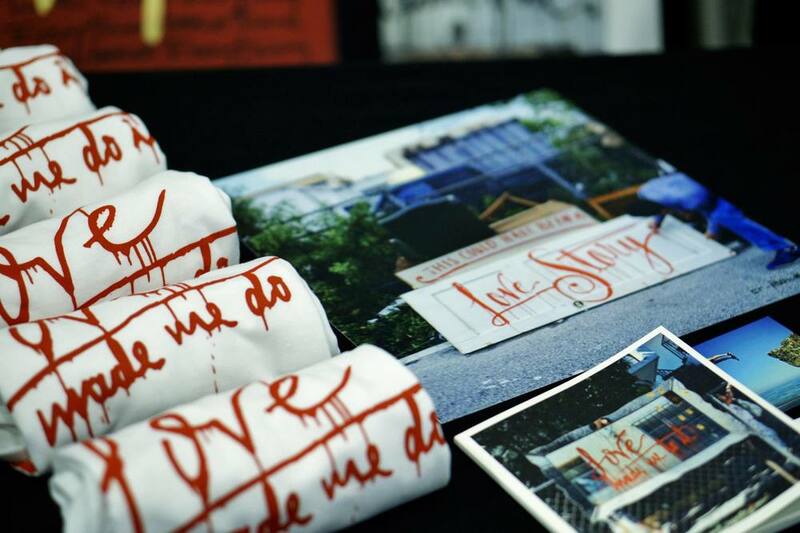 All funds will go to towards Artseen, the school's off-site visual arts studios. Thank you Faena Forum for the hospitality. It was truly a wonderful night. Our CReative Director Camilo Rojas featured on Univision. Thank you Univision, Despierta América, Dish Latino and Sigue Haciéndola for the feature. Gracias totales! Honored to have the project Miami Motel Stories selected and featured by Behance, the leading online platform to showcases & discover creative work! Camilo Rojas honored to have been selected and showcased as one of the 30 most notable alumni in the 30 years of New World School of the Arts’ history. 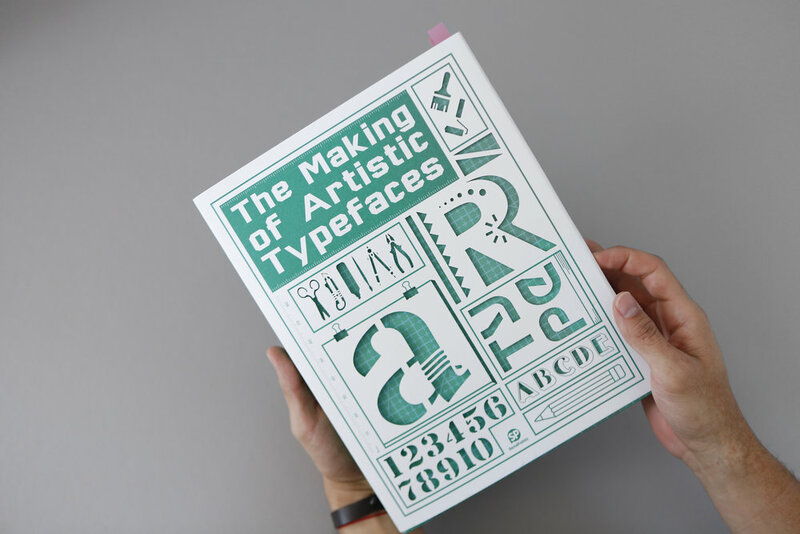 Honored to have been selected and featured in this amazing book “THE MAKING OF ARTISTIC TYPEFACES” which focuses on creative and artistic handmade typography, presenting complete process including materials, tools, techniques, and final results. Honored to have the project This Must Be The Place selected and featured by Behance, the leading online platform to showcase & discover creative work! Our creative director Camilo Rojas have been selected and invited to exhibit his work at the Sharjah Calligraphy Biennial Under the great patronage of His Highness Sheikh Dr. Sultan Bin Mohammed Al Qasimi, the Supreme Council Member and Ruler of Sharjah. Sharjah Calligraphy Biennial has always been known to be of one of the most remarkable events taking place in the region. It aim at revealing the power of the letter in bringing cultures together. It is an art that reflects the spirit of the place and the existence. The event is a celebration of Arabic calligraphy and its creators, and aims to make the world realise the beauty and authenticity of the Arabic letter. It introduces the features of Islamic civilization as it is a major form of artistic expression in Islamic cultures, especially and particularly in religious contexts. Opening: Thursday, April 7th, 2016. 10:00 a.m.
Honored to have been selected and featured this week in this amazing book “Transparent” which unveils the mutable visual experiences of transparency and how they can be achieved through the inventive use of materials, paper and printing. Encompassing brand identities, product packaging, photography as well as installations.Thank you to all my client/comrades for allowing us to CR_eate design with character. Honored to have been selected and featured this week in this amazing book “Transparent” which unveils the mutable visual experiences of transparency and how they can be achieved through the inventive use of materials, paper and printing. 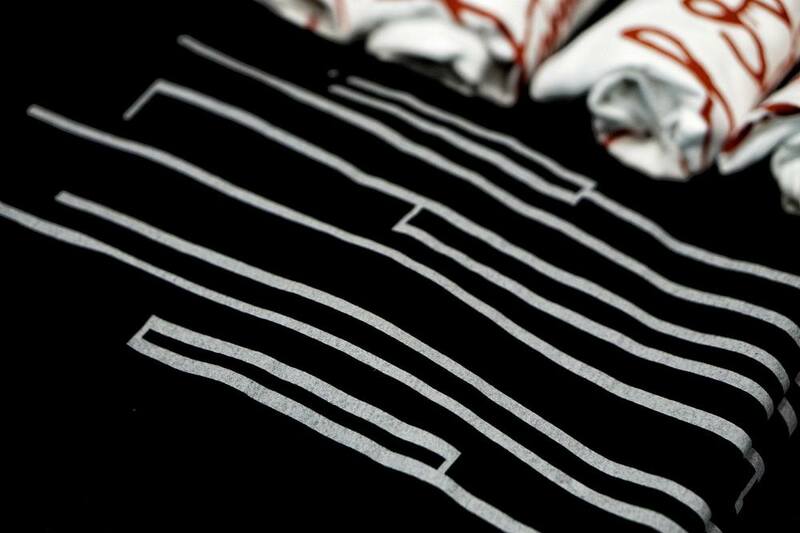 Encompassing brand identities, product packaging, photography as well as installations. Honored to have our work selected and featured in 6 pages for this book “RSVP” among other great studios such as Leo Burnett, RoAndCo and more. It’s been a great process to produce remarkable invitations by exploring different techniques and unconventional materials that not only secure a RSVP, but also creates excitement and engagement with the audience. 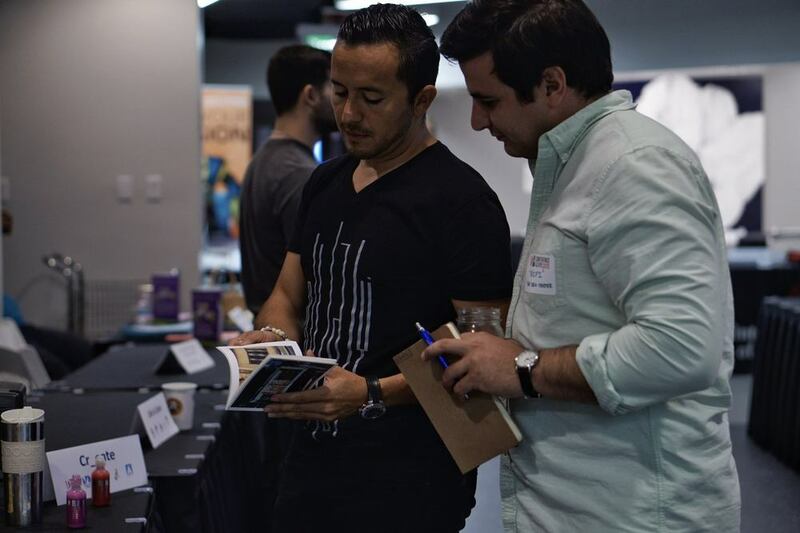 Honored to have been invited as a panelist in the Branding & Visual Identity panel with Rosario Martinez-Cañas for the “D3 Digital Design Den” an interdisciplinary design conference & expo for the next generation of creative minds to learn the art and business of design. Delighted to announce the selection of two of our typographic projects for the Type Player 3 book by Sandu Publishing Co., which takes an entirely fresh look at the extraordinary typography design today, Whether client-based commissions or experimental exercises, the numerous examples are to demonstrate how these designers challenge traditional limitations and push at the boundaries of typographic conventions. We have a fresh new set of Business cards. Yep, and they are squared, made out of Four layers of sumptuous Mohawk Superfine paper, sandwiched together and with a different design/story on everyone. They were designed with the idea of reflect my personality, from Playful, Adventurous, professional and with sense of creativity and passion for what i do every day. Let's exchange them, let's collaborate, let's do business, let's start a conversation. Cheers! This piece was created with much love and respect for you, Mi Selección Colombia. Thank you for putting your hearts and passion in the football field and bringing us this far. Thank you James Rodriguez for leading our team with your playmaking brilliance and making us dream. Let’s Keep this dream alive, let’s make history. Had a Fun radio interview and talk about typography and CR-eate with the ladies from @pfunkmedia at @klangbox FM. 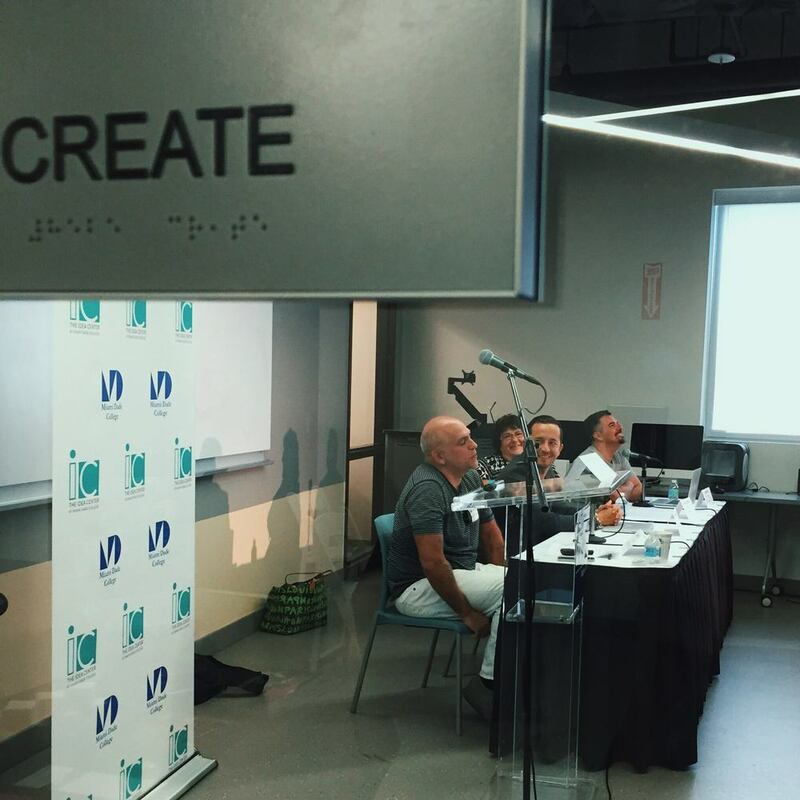 LAB Report is a radio show and podcast that showcases the arts, education, entrepreneurship and technology communities in South Florida and hosted by pFunk Media’s Camila Souza and Pabla Ayala. Please take a look at our latest commissioned typographic installation "Taking Action" at the main entrance of the The LAB Miami - a campus for social and tech innovation, an entrepreneurial community of creatives that learn, act & build together. 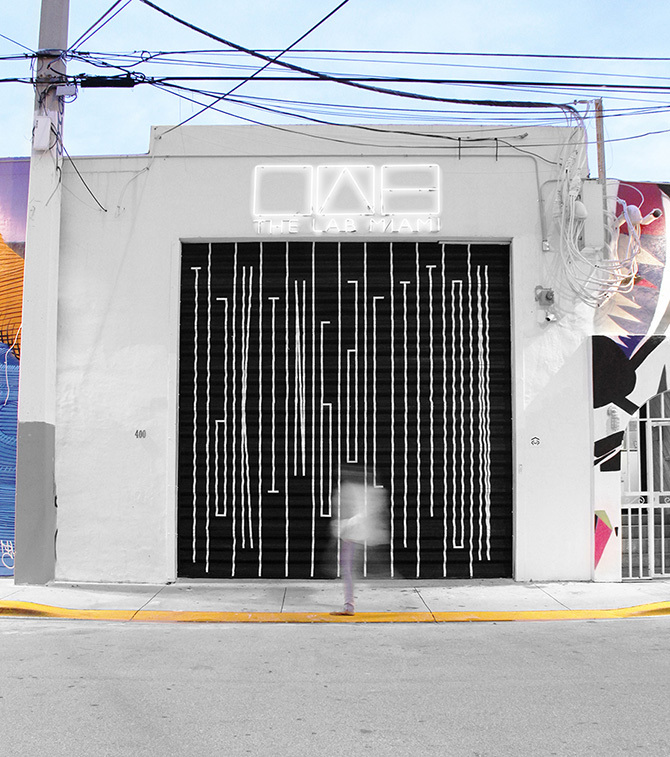 The LAB Miami It's located in the The Wynwood Arts District in Miami, home to over 70 Art Galleries, Retail Stores, Antique Shops, Eclectic Bars, and one of the largest open-air street-art installations in the world. Honored to have 8 pages showcasing our environmental design and experimental typographic work in “Great Idea Petite Typeface” book, along great ninja designers such as Losiento, Ben Johnston, Stefan Sagmeister among others. Privileged to be featured in www.colombiatoshare.com, a space dedicated to share the Colombian talent to the rest of the world. Check it out! Honored to be selected for “Creatives Rising” a digital exhibition in New York City, celebrating the work of creatives from across the globe. 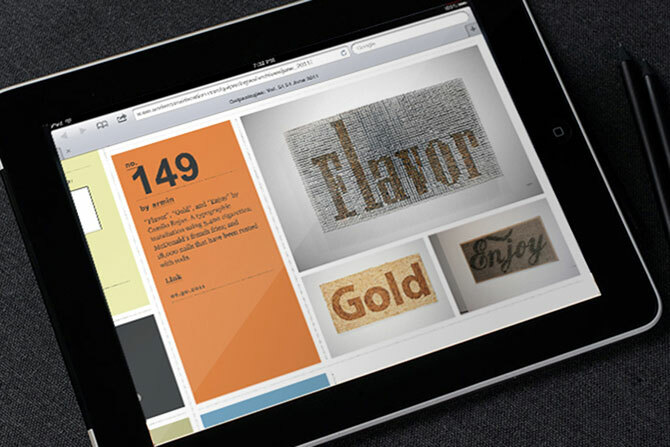 Honored to be featured on the front page of www.typographyserved.com, a platform that features creatives that promotes new thinking, selecting only a small number of projects, With many thousands to choose from. Honored to be selected for “The Story of the Creative” Exhibition in one of the most exquisite venues in New York City. This collection of work features a diverse range of mediums, styles, influences, and inspirations. The work displayed will include sculpture, works on paper, check it out! Honored to be invited to showcase our work at the Gallery of The Beijing institute of Graphic Communication, as part of the 100 typographic posters International Exhibition, Opening Ceremony: Saturday, May 11, 2013. 10am. My work will explore and underline how much we take our products as an evidence, totally loose of its source. Most of us buy and use so many clothing and products without ever thinking about their country of origin and the journey these goods make, before they eventually are displayed in our shops. …Because glamorous goods aren't made in glamorous factories! Zurisimo, an identity created by Camilo Rojas for zurich based boutique was selected and featured in the book 'Good Idea Two" by Hightone Book. Honored to be selected and featured in the book "Take My Time: Creative Calendar Design" published by Chois Publishing, which brings together a collection of the most creative calendar designs from the world. It highlights more than 112 distinguished works with detailed and comprehensive classification plus an innovative book cover. This is a delightful book for anyone who wants to explore the universality of calendar design. Honored to be selected and featured in BranD Magazine “OrganicISM” 200 page Issue, which showcases the brand design works and design initiatives that are fascinated by natural organisms and the concept of organic. Across all the elements that are included within Brand Design, they want to present to the readers: how the idea of organic is interpreted by the whole world of Brand Design, how our commercial world is being shaped by the growing organic products/brands and market, what is the natural belief behind “organic” and how is it interpreted culturally in the commercial world. [BranD] is a bimonthly English-language internationally distributed magazine tailored for both established and emerging Brand Design professionals around the world. [BranD] informs and influences a wide range of designers and initiatives with the latest top Brand Design cases, concepts and trend leading visions. Honored to be featured on the front page renowned creative community NOTCOT, showcasing the project created for neighborhood burger joint LoKal Miami. Honored to be featured on the front page of www.artserved.com, a behance's platform that features creatives that promotes new thinking, selecting only a small number of projects, With many thousands to choose from. Fortunate to attend Design Indaba 2012 Conference and listening to great speakers and creative individuals, and left really inspired by designer, activist and agitator committed to promoting change "Porky Hefer". “This talk is not to change the world, but rather to offer some words of encouragement,” declared Porky starting his presentation Calling himself a “brand interventionist”, Hefer believes in demonstrating rather than describing. As a creative doer, Hefer is all about keeping things simple and solving problems. Honored to have our designs selected and showcased on the "Book of Creation" a new journal dedicated to the digital image in all its forms and showcasing the best artists around the world in one book. honoré de etre sélectionnés par Book Of Creation, une nouvelle revue dédiée à l’image numérique sous toutes ces formes, à resembler les meilleur artistes du monde entier en un seul ouvrage. Honored to have our packaging designs selected and showcased on the "International Design Yearbook 2011 book" reflecting the overall style and design level of international graphic design industry. The book is published every year by Madison Series, one of the largest and most influential companies dedicated to showcasing international advertising and design. Honored to be selected and featured in TWOFOLD Magazine a United Kingdom based magazine created out of love for everything illustration and typography, showcasing some of the world's best talent! Check out the other artists! Honored to be featured on the front page of www.photographyserved.com a behance's platform that features creatives that promotes new thinking, selecting only a small number of projects, With many thousands to choose from. Now, Put on your thermals, follow the mercury as low as it can go and take a look at this hot spot, Winter/Austria. Delighted to announce the selection of our typographic calendar for the book "365 days of design" creative calendar solutions, selected by Marc Gimenez, and published by Monsa publications. Honored to be selected for this year's exhibition at the Flagler Arts Space “Young Blood: So Fresh.” It opens to the public during Wynwood’s Art Walk on Second Saturday, August 13, 2011 from 7-10 PM, and will be on view until September 3, 2011. I'm honored to share with you i have been selected as one of the 100 worldwide eco-designers featured in the book Love Earth: 100 Eco Ideas + 100 Eco Designs, by Victio:nary. 100 eco-ideas is a prelude to 100 eco-designs. It is a body of creative and sensible proposal contributed by a bevy of visionaries from around the world. 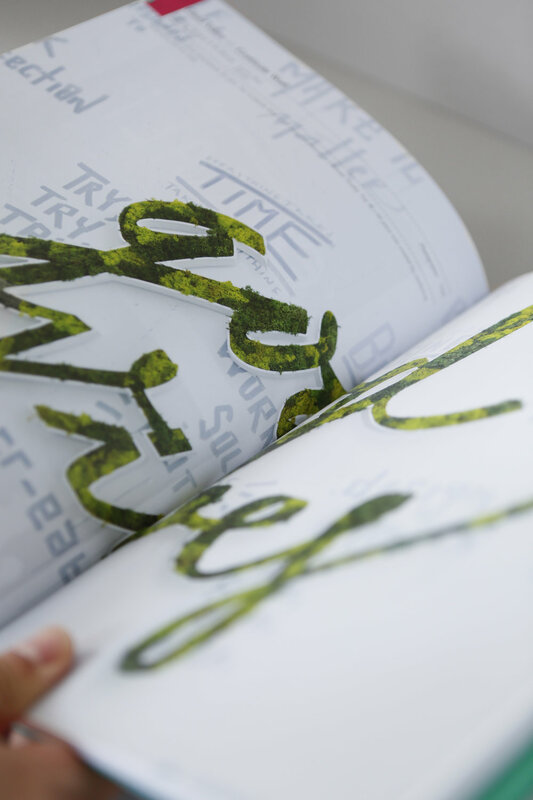 "The book is an ode to green design—the cover is even made from the recycled scraps from the bookmaking process. Inside its cover, the volume starts with a mini-book featuring 100 Eco Ideas, green tips and suggestions solicited from the public and illustrated by Guillaume Kashima. 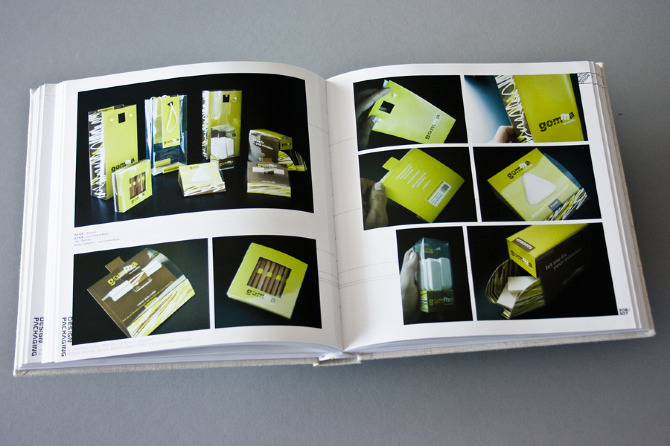 The rest of the book features 100 eco-designs that range from products to packaging. While some are green in their use (or reuse) of materials and their innovative processes, some simply remind you to be conscious of the environment with their quirky, sometimes strange perspectives"
Delighted to announce the selection of my typographic projects for the Type Player 2 book, which takes an entirely fresh look at the extraordinary typography design today, including work ranging from editorial, illustration, fashion, hand-made to environment. Whether client-based commissions or experimental exercises, the numerous examples are to demonstrate how these designers challenge traditional limitations and push at the boundaries of typographic conventions. 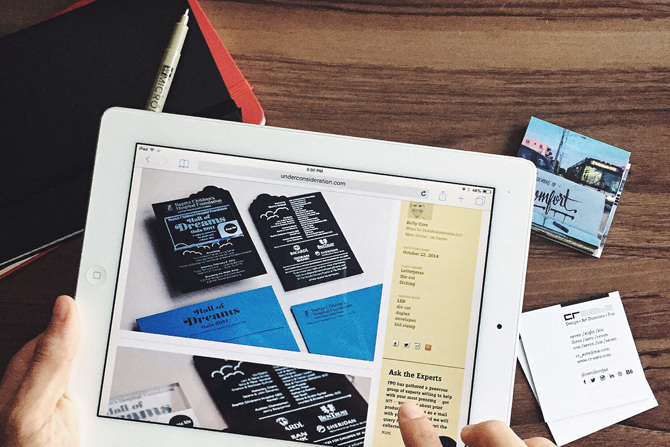 It will be an indispensable source of inspiration for designers and creatives alike. Honored to be selected and featured on underconsideration, major design blog Chronicling the most curious, creative, and notable projects, stories, and events of the graphic design industry on a daily basis. I had the honor of being featured in 6 pages of this great publication which focus in showcasing the latest and cutting-edge designs inspired by applications and creations of various illustrations, graphics, patterns and fonts selected from some talented designers and artist worldwide. The ambition of this exhibition project is to show the omnipresent existence of lettering in daily life and its influence on public perception. Typography and lettering in context of art opens quite a new perspective to the topic - for laymen, art connoisseurs, as well as professionals in graphic design. Delighted to announce the selection of my photographs under the "Desire" concept for he Karma Magazine, a digital mag that wants to expose and share the works of differents artists inside the media of design, ilustration and photography. It features lots of interesting ways various designers have constructed handmade typefaces and letter forms and it is described as "the most comprehensive showcase of three-dimensional letter forms ever written". It was an honor to be invited to join the great team of the annual mentoring program for young children at New World School of the Arts, facilitating them in creating artwork based on a theme. Our job was to create on a one-on-one basis covering fundamental art and design concepts, computer layout programs and various other media including painting, photography and collage. Allow me to invite you to check my new photo project, captured with an iPhone during my visit to china in 2009. Solemnly and slowly, with his index finger extended, Napoleon Bonaparte outlined a great stretch of country on a map of the world. "There," he growled, "is a sleeping giant. Let him sleep! If he wakes, he will shake the world." December 31th, 2010 • Happy holidays! December is here, and the world is getting nostalgic as we end a decade. Normally, people have this habit of fixing their gaze on the future, looking for the next best thing. But today, i would like to stop and take a little bit of your time to extend my gratitude to all of you, by creating and showing this self initiated project, created using a found wood panel, colored duct tape and filmed with my small iphone but with a big positive intention. Thank you my friends for your support and for being part of my life this year. Keep Dreaming my ninjas, are you ready? This is one of the 9 illustrations commissioned for Italian magazine Zoom-Zoom / Mazda. The illustrations were showcased across a 424 x 276mm spread and featured places such as the Triennale Bovisa, the Bosisa district The Straf Hotel and Mr. Ikuo Maeda, the design chief at Mazda Motor Corp. This is a self initiated ongoing photo journal where every photo I take tells the story of a recent quote that I have read or captures a personal life experience. This journal may be filled with equal parts of irony, playful attitude and positive humor, in order to raise a smile, to incite reflection, and to favor an enlightened conscience. As you all probably know, I've been living in Paris for the past 6 months: loving the city, and missing my loved ones terribly, but most importantly knowing that being creative means living a creative life. and attitude. I created this e-mail, first to say hello; also, to show you some of the projects that i've been involved with lately and to keep our contact. Featured in great online publications, thank you guys! I love sticky tape is dedicated to the art and times of sticky tape, which also goes by the names - sello tape, packing tape, gaffer tape and masking tape. It may be of interest to anyone interested in stationery, catching flies, art or design. Recently, I had the pleasure of being featured on the website Untitled32.com, a virtual designed based publication for students and by students. For their August 2010 edition, the website highlighted NWSA visual arts faculty Rosario Martinez-Cañas and myself as part of the NWSA arts alumni. Check out what Rosario and myself have to say about our career and vision. Excellent news! 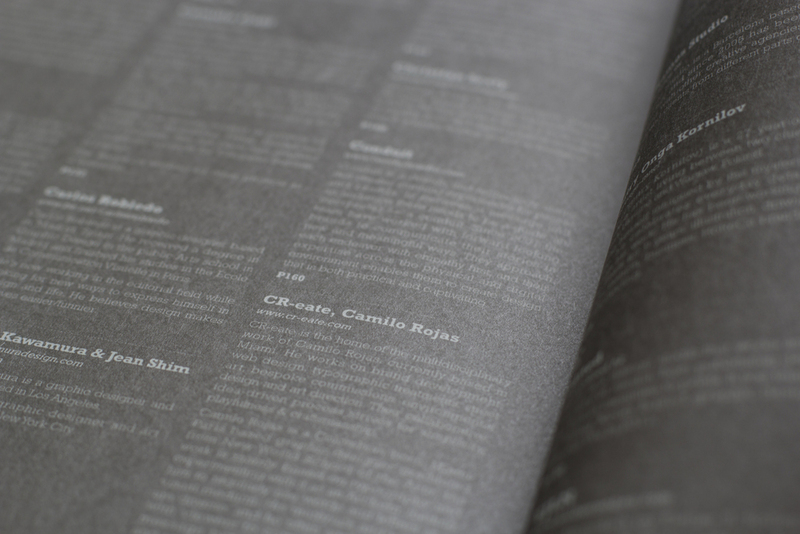 The book "Typography Today" is featuring some of my work, actually around 12 pages sharing my projects. it's great to be in the same publication among amazing designers like Vaughan Oliver, Cooky Yoon, and Ethan Parkthat etc, we've been using different materials to manipulate and give a new meaning to type. The book explores the work of different innovative artists that "defy accepted conventions, using food, fabric, wood, metal, plastic and more to enhance their work. Attention is paid not only to form, but to the materials used to construct letters and numbers, with whimsical and playful results." One way to call it Type without limits! Great news today. My work has been featured along great designers as Amandine Alessandra, Stefan Sagmeister, Thorbjørn Ankerstjerne, asa~ama, Autobahn, Huda Abdul Aziz, Andrew Byrom, Rhett Dashwood, Keetra Dean Dixon, Oded Ezer, Hikaru Furuhashi, Typeworkshop, and many many more. Can you really compare experimental 3D typography – like lettering made of live moss or letter kites that fly messages in the sky – to the work of Gutenberg? If you ask Jeanette Abbink, Emily CM Anderson and the over 100 international designers, typographers and artists featured in 3D Typography, the answer is a resounding yes. Via @MichaelSurtees, a review of the book 3D Typography, "... this book captured something that most books dealing with images found on the internet miss on - timelessness." It's December 31st, and the world is getting nostalgic as we end a decade. Normally, people have this habit of fixing their gaze on the future, looking for the next best thing. But today, i would like to to stop and take a little bit of your time to remember 2009 and extend my gratitude to all of you, my friends for your support and for being part of my life this year. Travel in Swatch MTV Playground. After coming back from a wonderful travel experience in Asia, I found myself with great news in my mailbox from Swatch MTV Playground: a copy of the printed material showcasing my work along with other winning pieces of this creative community. A piece of my work (Travel :: Things to do in 2009) was included, and distributed at several events for Swatch MTV Playground, a community that connects the most exciting and innovative creative talent from across the globe. According to Swatch MTV Playground "We feel this piece of work is original and exciting, and successfully brings to life the energy and spirit of Swatch MTV Playground." 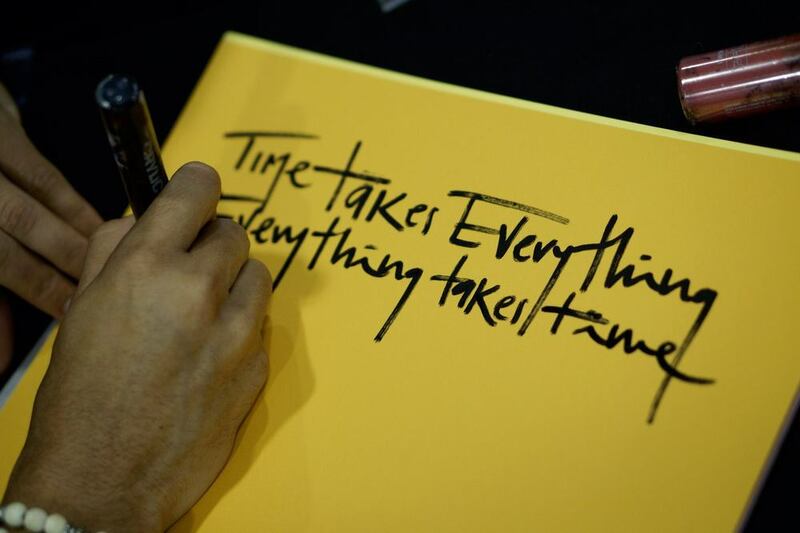 The piece will be displayed at the events alongside established artist work, plus will be made available as a limited edition poster and postcard which will be given away free of charge at these events as well as at selected Swatch stores across Europe. Swatch MTV Playground is staging a series of events around Europe and Asia to showcase some of the best and most original work that’s been uploaded to swatchmtvplayground.com. Events will be taking place in Greece (Athens), Switzerland (Luzern), Netherlands (Amsterdam), Spain, Germany (Berlin), Japan (Tokyo), Korea (Seoul) and China (Beijing, Shanghai, Guangzhou). Some of these events will also be filmed for MTV programming to be shown all around Europe and Asia! Very excited to confirm my attendance to this year’s Icograda Design Conference along my fellow designers and faculty from New World School of the Arts. The biennial Icograda World Design Congress will be held in Beijing, China for the first time. From 24-30 October 2009, Feeling very lucky to be one of the few people from the states to be able to attend and take advantage of this amazing conference. I have everything ready, tickets, hotel, check check… Looking forward to meeting lots of fellow designers and people from the creative industry; can’t wait to be there, hit me up if you are going! I was recognized on Wednesday, September 9th, by Miami Beach Commissioner Jerry Libbin, as the winner of the "Keep our beaches clean" Poster Design Contest. Sponsored by the City of Miami Beach, in partnership with Surfrider Foundation, ECOMB, A Better Miami Beach and GreenRocks, the contest is an effort to educate Miami Beach residents and visitors about the harmful effects of litter on our beaches. I finished the logo for the Young 2 Store in China. The idea of opening this store came from the inspiration of Eric Chin and his sister. They wanted to have a place where young couples about to get married could find the perfect gowns and suits for their big day. The store rents gowns and suits and it also offers a dressing up service, which guides you through the process of selecting a gown or suit and looking your best. The store name Young 2, also means square young, representing two young people who are about to get married and want to dress up, looking young staying young and looking their best for this special day. 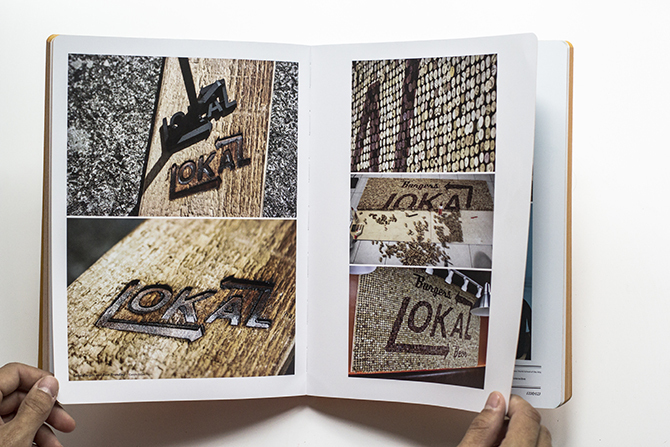 Very excited after receiving the Type Player book, which features some of my work. This book looks to show that type is everywhere: from posters and book covers to t-shirt prints and signage. Yet, despite its ubiquitousness, it is still one of the elements of design that is played with the most. The fact that those who design with type must work within the constraints of the alphabet seems only to inspire more and more spirited, irreverent and inventive uses of its basic shapes and symbols. Type Player is a celebration of these innovators, and of the surprising and varied work that they create. Buena Nueva para empezar el año. Mi trabajo fue seleccionado dentro de los 10 trabajos tipográficos más importantes del 2008 en Behance, por Matias Correa, Jefe del departamento de diseño del mismo! Tomorrow I start working on a very special project: Macy’s stores has put me in charge of designing their Holiday Window display at their South Beach Store, which looks to bring a message of hope and the holiday spirit. Looking forward to experimenting with typography!